Happy birthday my dear friend. I hope you have a wonderful day and a blessed year. I look forward to celebrating many more birthdays, dinners, jokes, libations, carnivals and weddings/births *wink,wink* with you. Love Ya! 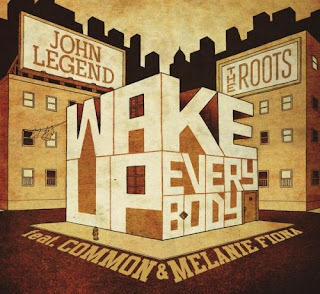 Here’s the official video for John Legend and The Roots collaboration “Wake Up Everybody,” featuring Common and Melanie Fiona. Featuring 11 tracks inspired by the Soul of the ’60s and ’70s and incorporating elements of gospel, rock, reggae and Hip Hop, Wake Up! is due for release on September 21st through Sony Music. I find it rather funny. A New Edition To Your Bikini Wax! An airbrush tattoo applied directly after a completely bare bikini wax, Vattooing lets you live dangerously temporarily. Get “inked” with your beau’s initials, or go for a flirty design—the tattoo you choose is up to you. Get a flower, butterfly, sun, or letters inked in your favorite color. A trained technician applies an exclusive stencil and airbrushes the ink directly onto the area, giving you a coy secret to hide—or reveal—as you choose. The ink lasts up to five days for commitment-free, flirtatious fun. Regular price: $115 includes the bikini wax. Growing up, I definitely took these fruits for granted. Now, I'll kill for some sweet sugar apple, sea grapes and guineps. While on my "mandatory" tour of Antigua, we got lucky. The Fruit Gods blessed us! As a child, my mother put the fear of God in me when eating guineps. She had a childhood friend that choked on the seed. She would make us bite through the seed before sucking on it so it's no longer round. I know I'll have my kids do the same. Thanks Mom! Seriously, when you find a sweet guinep tree you guard it with your life, you keep it a secret and find someone agile to climb the tree for you. We didn't have to do any climbing. We got this bunch of guineps when we pulled into a gas station from a little girl who was all about making some money. 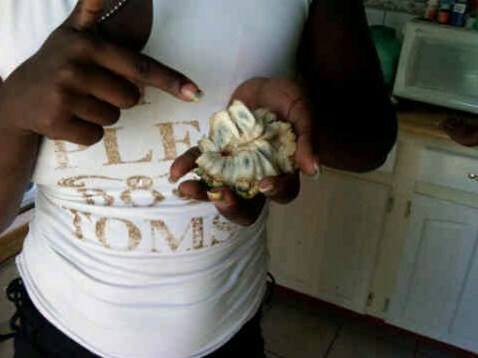 Sugar Apple has always been one of my favorite fruits...second to passion fruit. It can be messy because the flesh/meat is mushy and ohhhhh soooo gooooooood. There are tons of seeds and eating it can be tedius but I think it makes for longer enjoyment ;). Who dare refuses that??? The story behind the pic below: When we bought the 2 sugar apples, we ate one before I got to take any pics of the flesh/meat. So, I kept the other one and decided to eat it later and take the pics then. Well, I forgot it in the car and I left for Grenada the next day. Maybe 2 days later I got this pic on my BlackBerry from Feebs and Juliette enjoying MY sugar apple. So, that's what the flesh/meat look like. I haven't had sea grapes in over 15 years. I don't see the trees on beaches as much as I did while I was growing up in St. Thomas. So, when I saw this tree at Nelson's Dock Yard in Antigua... I tried to take it down and bring it back to Atlanta with me. The darker the berry the sweeter the fruit is the TRUTH with sea grapes. You don't want to eat the green grapes. They have large seeds and when you find a sweet tree...you try to make wine like my Mommy did. While in Grenada, we went to dinner at Water's Edge at Bel Air Plantation in St. David. Besides the mosquitoes, it was beautiful. It was a quiet night and the service was exceptional. I had a rum punch that was delish. Our server doubled as the bartender. She made us a fruit punch that was to die for. I swear she pulled out a Jack LaLanne juicer and juiced all fresh fruits. It was soooooo freakin' good. We also had dessert: pumpkin cheesecake and chocolate pie with ice cream which we devoured before I could pull out my camera. Since I'm a firm believer that carnival is not a spectator sport, it was hard for me to come to grips with the fact that I would not play pretty mas or Jab Jab on my first visits to Grenada for Spicemas. I was a bit overzealous and did 3 carnivals (Toronto, Antigua and Grenada) in 13 days. Something had to give. My flights alone were an arm. My costumes and staying "hydrated" were a leg, so I had to spend the rest of my coins wisely. I left Atlanta on Thursday, 7/29 to Toronto. Picked up my costume at Carnival Nationz and dealt with not having a headpiece and tail and also had to decorate my corset on Friday. Played Mas with a headpiece (YAY!) on Saturday then went to Machel that night. Left Machel early to go to the airport to head to Antigua. Arrived in Antigua on Sunday and immediately started making costumes for Exotic Mas. If I see another glue gun... I'm gonna SCREAM! The next few days kinda rolled into one. They consisted of J'ouvert, Monday and Tuesday Mas and Last Lap. Worked on the drinks truck for a few, which was a good vantage point. Went to the beach a few times, got my hair did by my twin,Tammy, on Browns Ave. (she real good and fast too). Full my belly and laughed plenty at Big Banana. Fell in love with Carib. Missed my flight to Grenada on Friday, so was given a tour of Antigua (again). Spent more time on the beach. Ate sugar apple, sea grapes and guineps. Yummy! 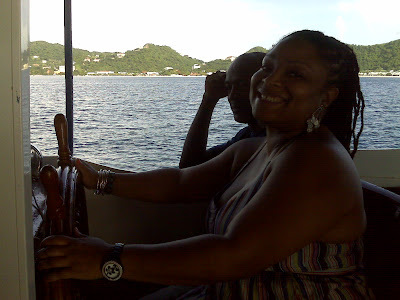 Here are some shots taken while on the "old folk" boat cruise. There is hope for me in my old age. These people were jamming, especially the man in the red T-shirt. I made friends with the Captain, so I was Co-Captain while he was praying for his life..lol. He looked so worried. He yelled at me when I sent a text while keeping us on course and elbowed me when navigated with one hand. I played Monday Night Mas with LIME instead of the original plan, Digicel. I had a blast. The mas band had 3000 people and won Monday Night Mas Band of the year. My section wore a yellow tank top, a top hat with a veil, party mug with a lighted bottom and a lighted baton. It was so pretty. All you saw were neon flashing lights for miles and revellers jammin' every man/woman dat dey meet on de road. Ah Jammin' every man dat ah meet on de road!!! This year I don't give a damn. I come like a champion. Tell dem ladies hold their man. I wine dem up one by one! This song was sooo sweet for Spicemas 2010! 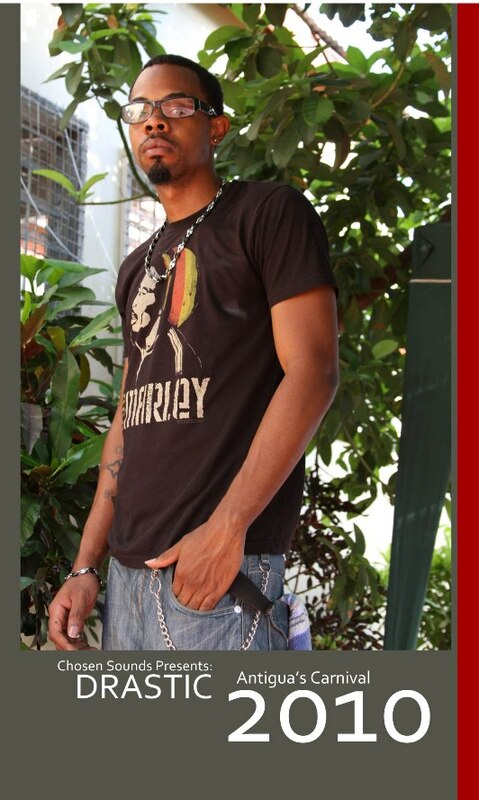 Don't worry... da gyul dem geh jam too. This is one of my favorite soca songs from Antigua's carnival 2010. It's by Drastic, one half of the group, BV & Drastic. 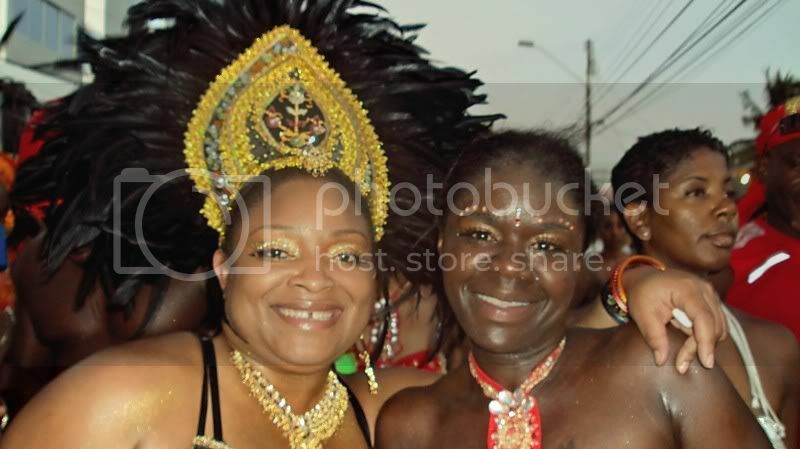 Here are some more pics of Caribana 2010 with Carnival Nationz in Toronto. Overall, Caribana was Mas!! There was some drama with my costume (no head piece and no tail) but Shanah, my section leader, took care of me. I remained composed during the costume drama as Shanah and D'bandit did a good job making me happy. They were both very apologetic knowing I didn't fly all the way to Toronto to get my money back. I got a refund for the tail and got my head piece a few hours before we crossed the stage. I love my head piece!! Happy Birthday Nicole "Bumm" J.